2000: Mafiaboy uses then experimental botnet to shut down CNN, Yahoo, Amazon and others. 2002: State of California server housing state's payroll database hacked; results in the first disclosure laws. 2003: Slammer worm hits MS SQL servers. 2004: Foonet offers black hat hosting. 2006: LA traffic signals hacked, opening door for cool movie subplots by actors like Seth Green. 2006: CardersMarket aggregates illegal services. 2008: ATM processor RBS Worldpay hacked, leading to $9.5 million in quick cash withdrawals. 2005-2008: Longest prison term for hacking may result from 'Segvec' Gonzalez efforts in data thievery. 2009: Conficker botnet with 'state-of-the-art encryption, and sophisticated peer-to-peer update'. 2009: Money mule Trojan horse grabs your online banking info from the comfort of your own home. Not many people in 1975 were aware of the possibilities for cybercrime. 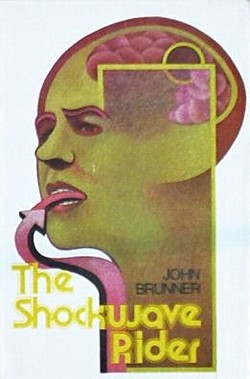 Readers of John Brunner's novel The Shockwave Rider, on the other hand, were well-positioned to see that trend coming. Take a moment to sample the variety of SF in the News articles related to The Shockwave Rider. In Brunner's novel, the biggest cybercriminals of all were the max-nat-ad corporations and the government.